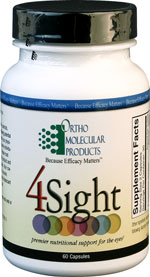 4 Sight is a combination supplement support regimen for the eyes. Measurable slowing of the degenerative process has been shown in patients who start using 4Sight before they develop antioxidant deficiency related eye problems. Zinc could slow the progression of these disorders. Results showed high levels of zinc and antioxidants did reduce the risk of macular degeneration. Taurine: is found in high concentrations in your eyes & is the most abundant amino acid in your retina. provides eyes with antioxidant protection. A deficiency of Taurine damages the retinas in people and animals. Resbid N - Acetyl Cysteine: Helpful with the treatment of dry eye syndrome. protects the eyes from environmental stress. Bilberry extract contains a high amount of anthocyanadins-antioxidants having a long history of success in hindering aldose reductase and improving capillary permeability. Alpha Lipoic Acid: is a powerful antioxidant which inhibits aldose reductase, thus preventing the sorbitol induced leakage of important antioxidants from eye tissue. Reduces cataract formation. Quercetin: as a bioflavonoid protects the eye from sun radiation plus being beneficial to the diabetic eye. Studies show it is helpful in preventing as well as treating eye problems such as macular degeneration. Ginkgo Biloba: helps increase blood flow in the head and eye area, thus delivering more oxygen and nutrients, It increases neurological activity and protects lipid membranes from oxidation- a logical therapeutic approach for oxidative eye damage. Lutein: Studies show that increased intake of lutein can lower the risk of age-related macular degeneration. The lutein dosage in 4Sight is more powerful than most, making 4Sight a more efficacious option for patients. Lycopene: The same studies have also found that low levels of Lycopene increase the risk of age related macular degeneration . Supplementation with sufficient dosages of Lutein and Lycopene is a wise choice for long-term eye care. Zeaxanthin: Helps protect the eye from ultra-violet (UV) damage, and prevents free-radical damage to the retina and the lens of the eye that is associated with diabetic retinopathy, macular degeneration, cataracts, and glaucoma. DIRECTIONS: 2 caps per day or as directed by a health care professional. Other Ingredients: Natural vegetable capsules. Palmitate, Microcrystalline, Cellulose, and Silicon Dioxide.